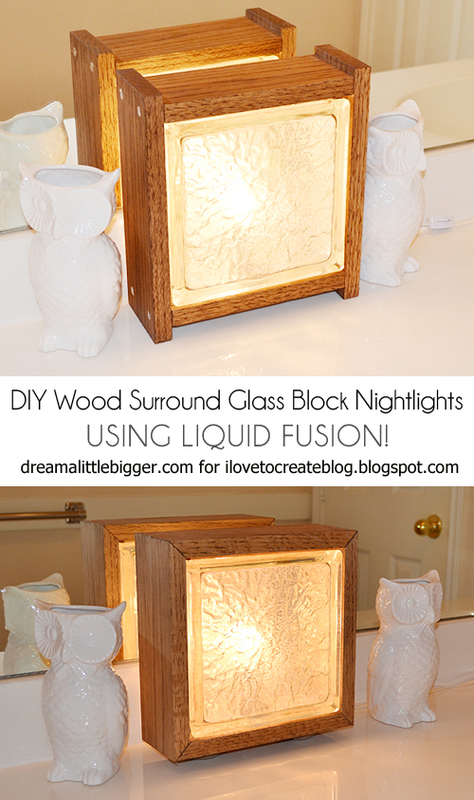 iLoveToCreate Blog: Wood Surround Glass Block Nightlight Featuring Liquid Fusion! 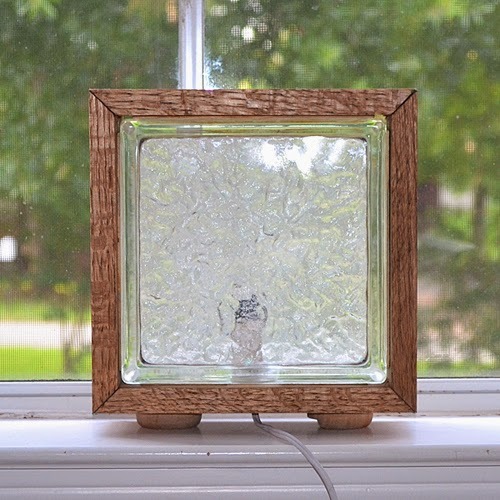 Wood Surround Glass Block Nightlight Featuring Liquid Fusion! When you have an adult parent and child with ADD walking through the home improvement store together you're bound to get some crazy ideas. 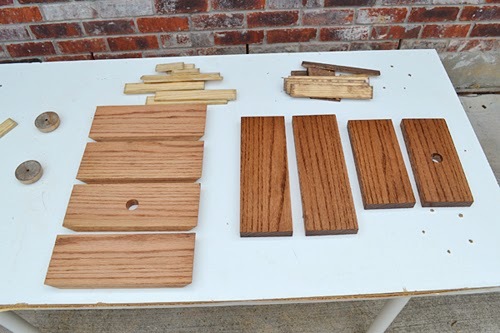 For instance, we came to the store to purchase something totally different for a totally different project but left with a couple of glass blocks and furniture grade oak boards. Why? Because I said to my dad, "wouldn't those things make a killer nightlight?" As it turns out, it was also a great project to test out one of iLoveToCreate's newest products... Liquid Fusion! And this is a big one, people, so we're just gonna hop right on into it! 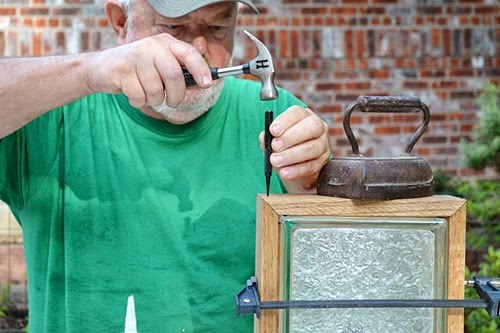 It's advisable to use a vise to hold your block steady as you cut the hole inside. 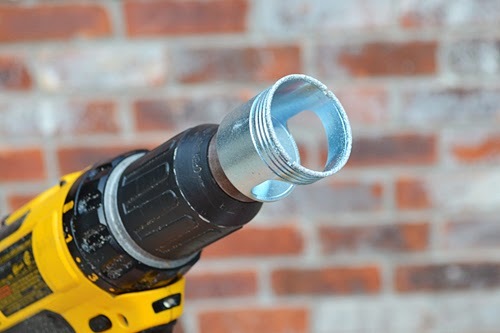 You can use a 1 3/8 DeWalt diamond hole cutter but these things can be SUPER PRICEY! Normally retailing around $40, you can score a great deal on them for around $12 if you keep your eyes peeled at online retailers like Amazon which is about the same price as the smaller diamond bit. My suggestion? Be patient and watch for the hole saw to go on sale! To start with the diamond hole saw, you're going to go in at an angle and slowly tilt the drill and bit upright after you start to get purchase in the plastic. When the drill gets going, you'll need to keep it cool and keep the little glass particles from flying up in the air where they can get into your eyes or be breathed into your lungs. 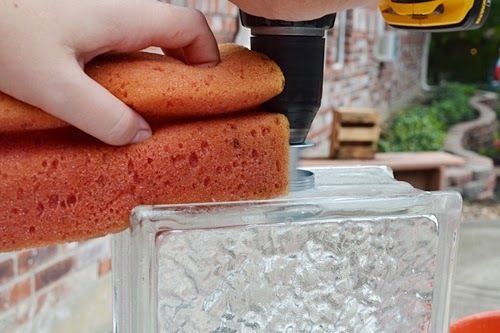 TO counteract you will keep a wet sponge pressed up against the drill bit, occasionally squeezing a bit of the water out to fill the hole that is being cut. 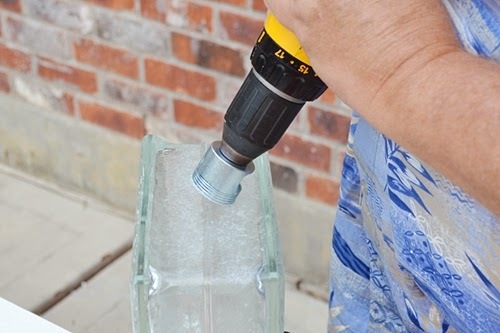 It probably is worth saying, here, that you should use a cordless drill when working with diamond bits and glass because of the water. Your hole will be pretty darn symmetrical and whatnot and the edges shouldn't be sharp. Oh, and that bowl is from our sponge. See how cloudy it is? That's the glass dust that transferred to the bowl every time the sponge was wet down again. 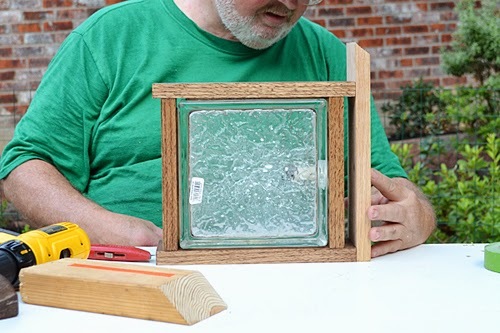 Next you'll need to cut your pine lath to fit within the edges of the glass block. 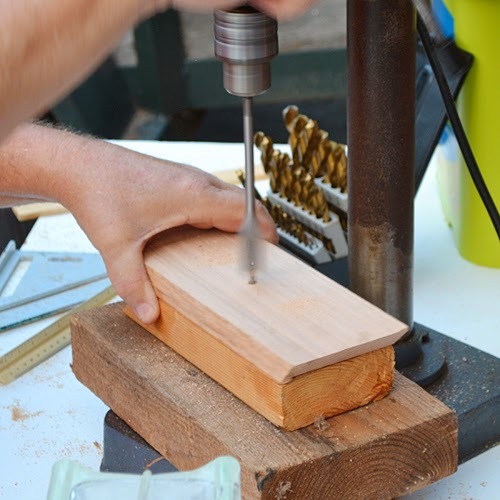 You'll need two pieces for each side except for the bottom where you drilled your hole. There you'll need four pieces, two for each side of the hole. A quick tip... when cutting your boards, to ensure that they are as similar as possible, use the first board to measure out and trim the other boards to! In one board (the bottom board) you'll need to cut out a hole that is 13/16". 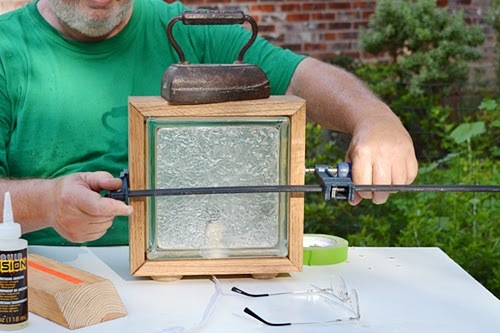 You can use a drill press, as seen here, but a regular handheld drill will work just as well. Stain your wood. The one on the left is weathered oak and the one on the right is special walnut, both on oak. Grab your light kit and get ready to do a little bit of surgery. And if this seems intimidating, it really shouldn't be! Simply remove the switch that turns the light off and on using a screwdriver. 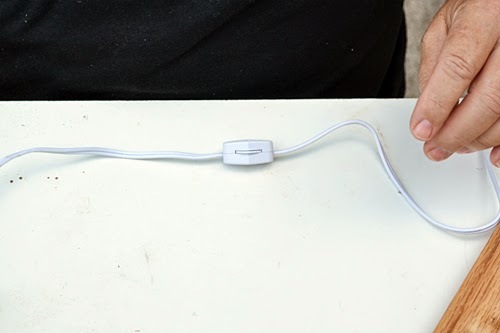 Take a pair of wire cutters and trim right through he middle of the wire (the top portion will NOT be connected, this is where the switch either connects or doesn't the electric current to turn the light off and on). 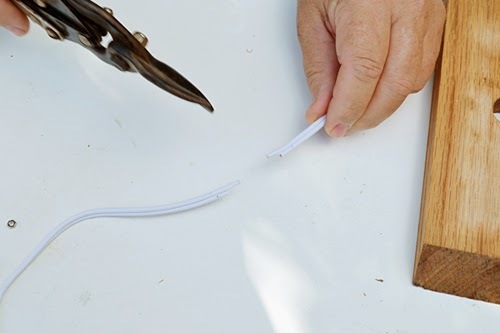 Slid your small piece of PVC pipe over the cut cord. 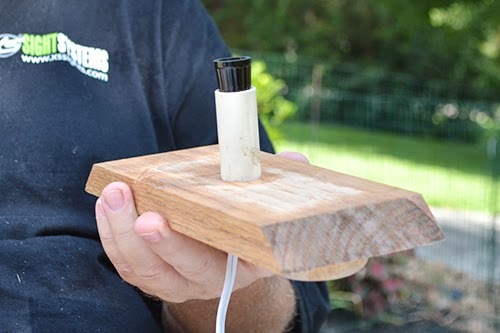 And glue the outside of the socket in place within the PVC pipe with Liquid Fusion. Using electrical tape reconnect the bottom portion of the wire to itself. 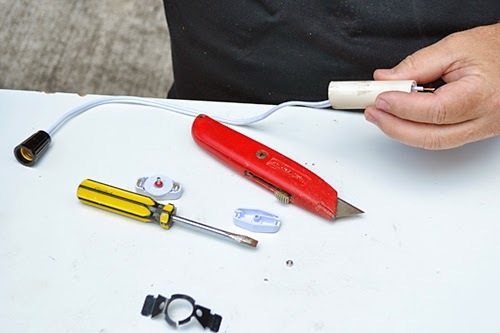 You may have to use a pocket knife or other sharp item to trim a way a bit of the plastic around the wires to get them to touch well enough for the connection to work. Screw the switch back together and TEST the light to make sure it works. You may need to finagle the wire to get it to work but I swear it's not that hard! 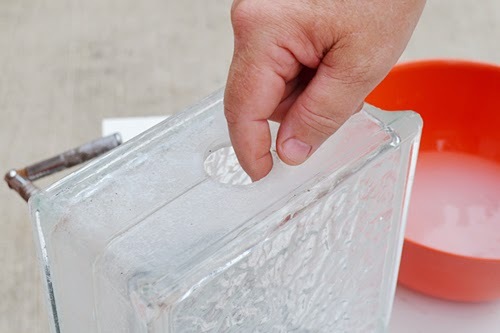 Push your pipe/socket through the hole trimmed in the bottom piece of the lamp. 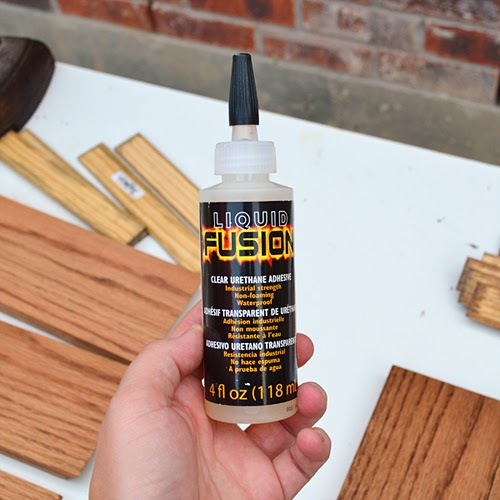 Use Liquid Fusion to glue into place. Allow to full dry. 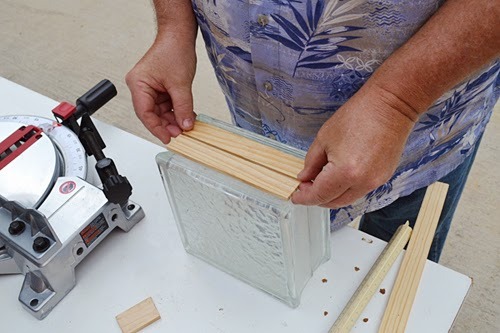 Next we're going to attach the finished wood pieces to the lath set around the glass. 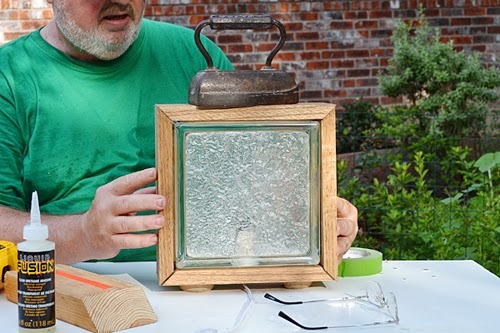 Apply a moderate amount of Liquid Fusion to the bottom side of the glass block and place the bottom on sliding the light through hole cut into the block. 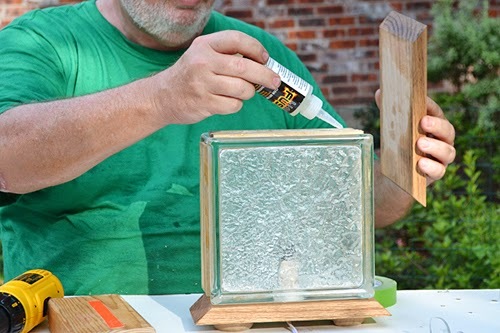 The weight of the block is enough to keep it secure while you glue the top piece as well. Add something heavy to weigh down the top to keep it from moving while you add on the sides. Take your side pieces and make sure that the square shape forms well. You may need to finagle the top and bottom pieces but no worries... the glue won't have set quite yet so just tap into place. 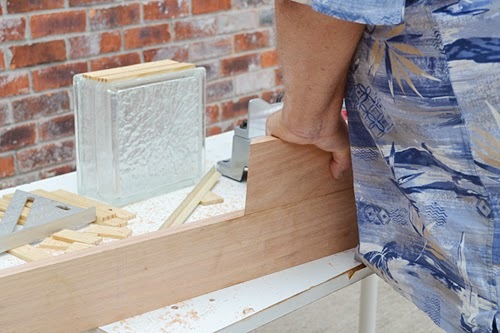 Apply Liquid Fusion to the lath on the sides and the cut edges for the corners on the side pieces. Secure into place and clamp together to finish drying. Allow to dry overnight before use. 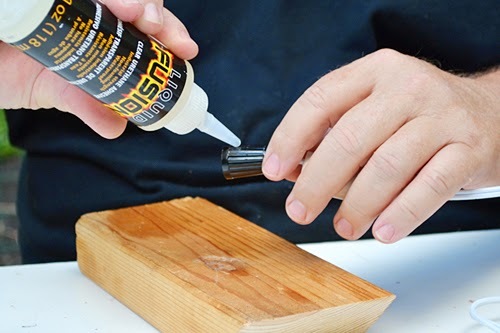 For the next version glue on the top and bottom piece and, on a flat surface glue the sides by placing the Liquid Fusion directly to the lath (but not the bottom board as indicated - woops!). Allow to fully dry. Next it is time to apply the sides. 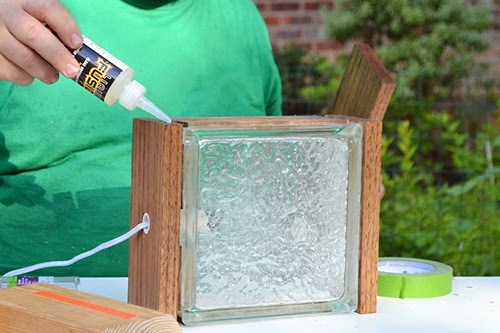 Squeeze Liquid Fusion onto the lath as well as the edges of the top and bottom boards and place the wood on top. Flip over and quickly do the same to the other side. Grab a straight piece of wood and use to level the side boards. Make sure to leave enough space at the bottom so that the side pieces also act as feet for the lamp. 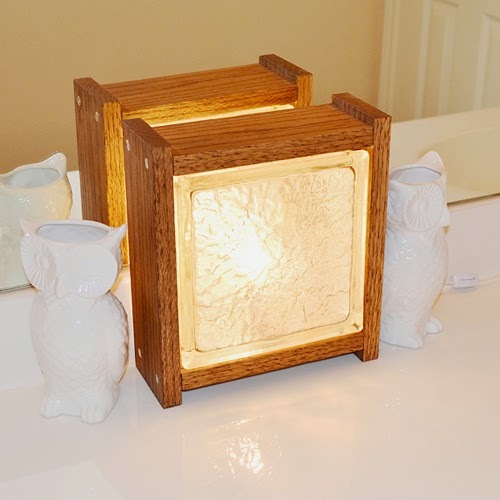 When this version of the lamp dries finish by screwing regular wood screws through the sides into the top and bottom pieces to secure (simply remove the screws on the bottom to slide out the bottom piece and change the bulb). Once the lamps are dry, drive trim nails into where the sides and tops meet up. 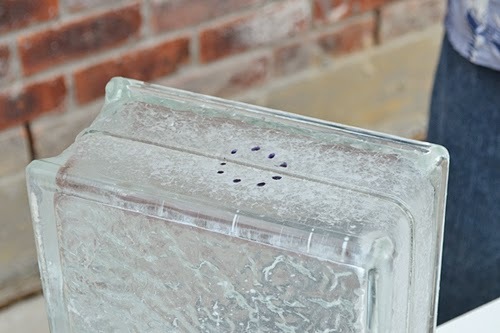 Use a nail punch to inset the nails so they are less visible. Apply wood putty if needed (we left ours alone, though). 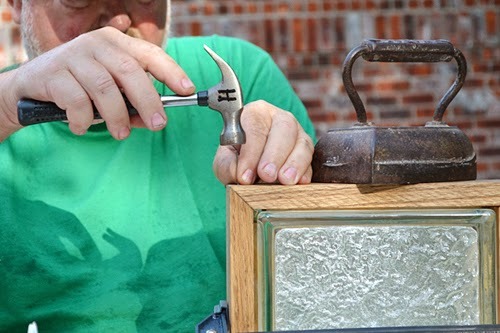 Apply screws through the bottom so that the bottom piece can be removed and the light bulb switched out. And here we have our fancy corner angled cut lamp. The light wood really works with the sharp corners, I think. This one was a lot more work but it's pretty awesome looking so it was worth it. I'd really say only try this one out if you are really comfortable making angled cuts, though. And here it is all nice and lit up as a pretty nightlight in the bathroom! Now here we were using 60W candle base light bulbs and 1. they're too bright and 2. they make the the lamp get awfully hot. I'd recommend using a smaller wattage in your lamps. This one was by far much, much easier and it wound up being our favorite out of the two, much to our surprise. 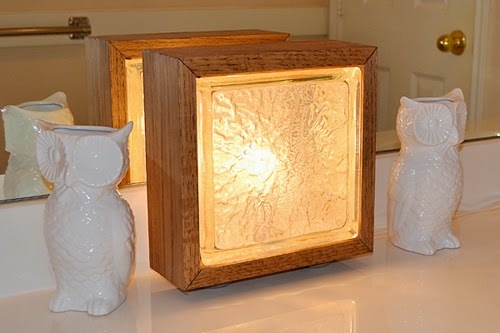 The glow of the candle gives the wood more of a golden appearance and the visible screws give it a more rustic look. If you liked this post, please visit me at my blog Dream a Little Bigger. Head over to our TIE DYE YOUR SUMMER site for even more inspiration, how-to's, and fun videos to get you mega-inDIY summer fun! Nice article and helpful information. 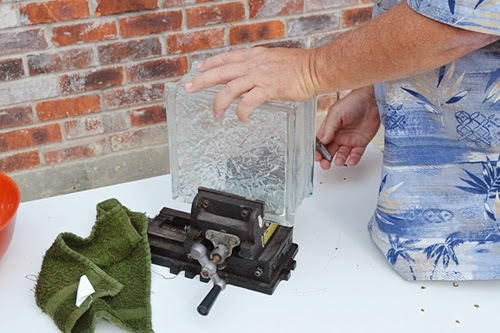 Another suggestion for the cutting of the hole in the glass block is to get your garden hose out and put it on a slow trickle. If you're using a drill press, this is relatively easy as you should be able to do the actually drilling with one hand and hold the hose in the other, if you're using a hand drill to cut the hole, then I'd suggest getting someone to help you (hold the hose - be sure it's someone you can trust not to dowse you with the water - LOL!) With the steady stream of water there is far less chance of accidently over-heating the bit, the block and/or the drill - any of which can be disasterous!!! ANOTHER MOST IMPORTANT CAUTIONARY TIP - IF you should break the glass block - DO NOT PICK UP WITH BARE HANDS - NO MATTER HOW CAREFULLY. This glass is as sharp as surgical equipment and the SLIGHTEST brush with it will slice you to the bone!!!! USE LEATHER WELDERS GLOVES OR BROOM AND DUSTPAN TO CLEAN UP BREAKAGE!!!!! Used to hand paint these bad boys (over a period of 7 yrs - over 9,000 blocks drilled) so I know of which I speak. Good luck! Thanks so much for the info, Lora! I had no idea how dangerous the shards could be so that is great to know! 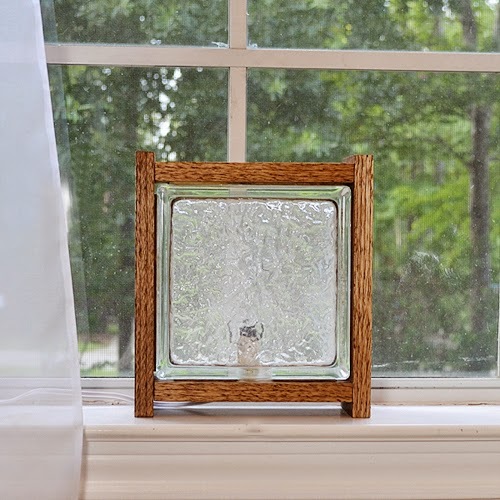 Do you glue the lath pieces to the glass or just lay them on the glass then attach the wood pieces to them?